This little book is one way to go about African exploration. “Canoe Errant on the Nile” describes the best way to discover the many ancient temples and historical attractions along the Nile, from Cairo. The author tells of his experiences during a cruise, not by motorised yacht or steam cruiser, but by a simple basic one-man canoe. Set out in 13 chapters, his story unfolds to show in a more leisurely way, the beauty of the Nile, along with an interesting sojourn in Cairo. Certainly an interesting way to look at African history and a fascinating tale. There are many books written about the life of David Livingstone and his wonderful journeys of African exploration. 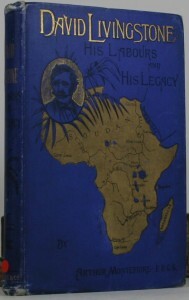 This book is set out in 12 chapters and it describes David Livingstone’s life and great achievements. David Livingstone certainly worked hard to advance our knowledge of Africa, as for more than 30 years, he journeyed nearly thirty thousand miles through the interior of Africa. An interesting book, about an amazing man. Treat yourself to a lazy boat trip down the Nile; go bargain-hunting in vibrant markets; discover ancient caravan routes through the desert. Whether your after Tutankhamun’s treasure, or just an afternoon with whirling dervishes, this guide to Egypt and the Sudan is packed with all the information you’ll need. This book of which I have the 1st. edition and a reprint, is the narrative of the last eleven years spent by the author Frederick Courteney Selous, on the Zambezi and its tributaries. It is an account of African exploration and gives an account of the colonisation of Masonaland and the progress of the gold industry in that country. 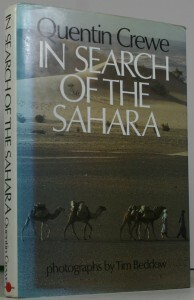 It sets out in 26 chapters, the author’s trek through Africa. 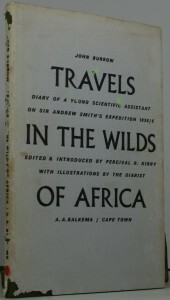 Possibly one of the finest trekkers/scouts and expeditionists Africa has produced. This is an amazing collection of ecological and botanical wonders. The title of this book more or less speaks for itself. 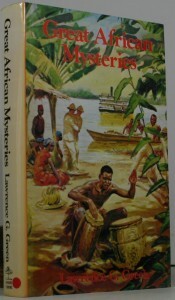 It is a series of stories about great African mysteries. 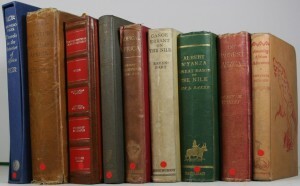 Set out in 22 chapters we hear: The drums of Africa; Mysteries of African explorers; The source of diamonds; Riddles of the African seas; Giants in the Jungle; Great Falls and lakes; Island treasure; The list goes on and on. Typical from the pen of Lawrence Green. This book describes some of the exploits of Ermin Pasha, who was Governor of Equatoria or French Equatorial Africa, west of the Anglo-Egyptian Sudan. 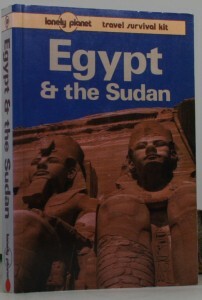 He lived during a period in African history, during the dark days of the struggle for control by Britain of the Sudan and Egypt. The request by Ermin Pasha to the British to rescue him and his country from being over run by Khurdish rebels,especialy after the death of General Gordon,in the struggle for British control in that area known as Darkest Africa. For two years and 25,000 miles, Quentin Crewe and photographer, Timothy Beddow, and various more or less durable companions roamed the greatest desert in the world. Certainly not one of the most hospitable of places, especially for a man in a wheelchair! In vehicles that groaned and spluttered in the stifling heat, they drove down tracks that were often pitted, cratered river beds, and/or sometimes just faint traces, liable to disappear suddenly in the sand and dust. Their main concerns were always water, food and the way. A true adventure story. 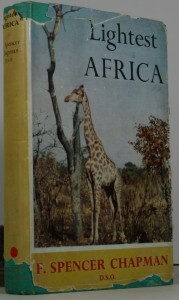 “Travels in the Wilds of Africa” is a marvellous book of African history. In 1834-1836 Dr. Andrew Smith undertook a great expedition to the northern area of South Africa. A member of his exploratory party was John Burrow, a youth of eighteen, who made a straightforward and concise description of the great journey. It was written to give its readers some idea of the vicissitudes of travel and of the thrills experienced by the travellers. Garnished by equally vivid pen-sketches made by the author, it is an eminently readable account of a memorable experience of African exploration. 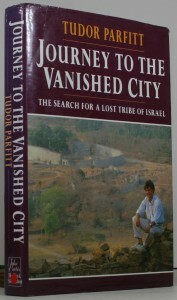 In this fascinating book Tudor Parfitt, intrepid traveller, described by the “Mail on Sunday” as a “sort of British Indiana Jones”, narrates the story of his often hazardous journey across Africa to solve a mystery. Who are the strange Lemba people who claim to be a lost Jewish tribe, and who sought his help in tracing their origins? Why is it that hitherto nothing has been heard of Semitic remnants in Central Africa? And where is the Lemba’s fabled city of Sena, from which they claim to have come centuries before? 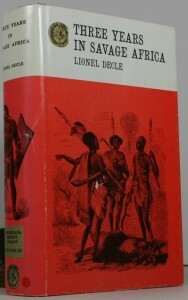 A fascinating account in to some African history and truly remarkable story. That Mr. Chapman Spencer should successfully accomplish his remarkable journey–travelling for nearly a year in a caravan over 17,000 miles of Africa, is not surprising to the many who have read his astonishing book “The Jungle is Neutral”. On this journey he took his wife and their three small sons in a fitted-up Austin van in which they cooked, slept, and travelled through every imaginable climate and kind of country. The list of events is as long as it is exotic, and the book must be read for it is full delights. Born in an overcrowded slum near Glasgow in 1813, David Livingstone spent his boyhood and youth working twelve and a half hours a day in a cotton mill. Yet he still found time to educate himself and eventually qualify as a doctor. He went to Africa as a medical missionary in 1841 and stayed for thirty years, returning home only twice for a total of two years. 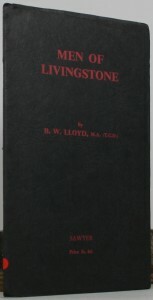 Published to coincide with the centenary of Livingstone’s death in 1873. A wonderful insight into African history. There is so much material written on the exploits and life of David Livingstone, that it would be difficult to discover any new angle of approach of any interest that has not been covered before. However this little booklet bases its theme on the men behind him, who gave him the support he needed to carry out his exploration work. It is a brief account of their part in his major expeditions in the years 1852-1873, and of the final journey where he perished with fever, and the men who literally carried his body home. “Travels in the interior of Africa” describes a journey through the present day states of Senegal and Mali, in the years 1795-1797. The dates and the places are important. They set Mungo Park at the very dawn of African exploration and in a corner of the continent which was to engage British interest only briefly. Mungo Park was out of context and overshadowed within a few decades of his travels, but the improbable setting of his tale and it’s inconsequential aftermath also help to account for its timeless quality. A glittering geographic tour of the remarkable history, peoples, creatures, sights and sounds of the largest and most austere desert on earth. 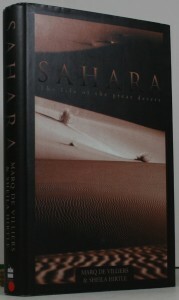 Ten thousand years ago, the Sahara was a temperate grassland. Petrified trees mark where forests used to stand, and former river beds are rich in the petrified bones of hippos, elephants, zebras, buffalo and gazelles. Then a slight shift in the earth’s axis transformed it into the greatest desert in the world with astonishing speed. 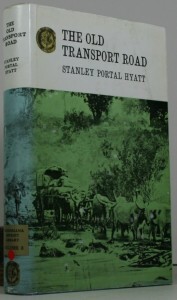 Stanley Portal Hyatt (1877-1914) died aged 37. 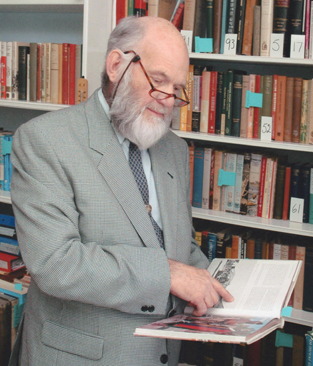 He was an early Rhodesian writer and historian, who settled in Matabeleland in 1899, and became a successful trader. Ruined by an outbreak of cattle disease, he travelled widely and began writing books on this part of Africa. This book describes the life of transport riding and trading in the south-east of Rhodesia, and of the massive wagon trains hauled by oxen over journeys of 500 plus miles, along the old transport road. 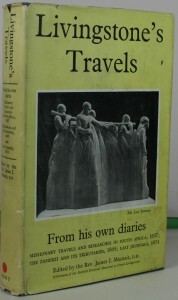 An amazing story of bygone travel. 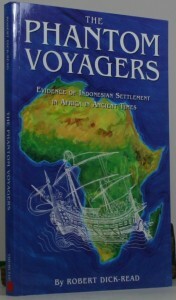 “The Phantom Voyagers” is about Indonesian mariners who came to Africa and Madagascar long before Europeans knew anything of Africa beyond the Sahara, and before Arabs and Shirazis sailed down the African coast to found such great cities as Lamu, Kilwa and Zanzibar. We know that Indonesians peopled Madagascar, but they left no written records. Their legacy on the mainland of Africa is far less well known. However, beneath the surface of the Africa we know today, the footprints and fingerprints of those phantom voyagers are legion. Brilliant historical material. We should be doing a grave injustice to Aloysius Horn if we failed to see that this third book is something bigger than an entertaining and elusive record of a wild past on the east side of Africa. It is for one thing, a serious indictment of the slave trade. 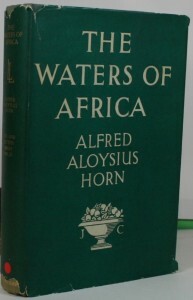 “The Waters of Africa”also demonstrates Aloysius Horn was a lover of nature and a stout and tender champion of Africa’s vanishing fauna. This book describes a massive undertaking, by a man who, by his own admission, would not class himself as an “explorer”, however he performed the longest journey achieved at one stretch, from the Atlantic to the Indian Ocean, covering over 2000 miles. The real interest of his journey, for the public, arises from the fact that he was able to study and compare the chief portions of the vast territory between the Cape and the Nile, now in the hands of the British Portuguese and German nations. An interesting look at African exploration. Three distinct parts of Africa were known to the relatively modern world: North Africa was where men went for their health, South Africa was where men went for money, and Central Africa was where they went for adventure – the Africa of Livingstone and Stanley. Into the heart of this mysterious Africa, the author takes us north from the delta of the Zambezi, by the water-route to the heart of Africa along the Zambezi and the Shire Rivers, along lake Nyanza, to its northerly extent near Mombasa. Here is another one of those simple but rather obscure books that describes a journey through various countries in Central and South-Eastern Africa. Another interesting story of an amazing African Adventure. 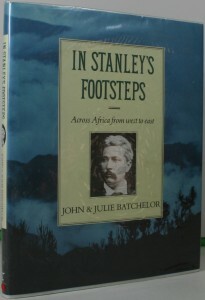 John and Julie Batchelor journeyed 3,000 miles in the footsteps of the famous explorer Henry Morton Stanley.They travelled by train,river boat,truck and dug-out from Matadi on the Atlantic coast of Zaire across Central Africa to Zanzibar on the Indian Ocean.Their trip included 900 miles along the Zaire River,where Joseph Conrad was once a river boat captain in the days when it was called the River Congo.They travelled also through the Ruwenzori Mountains,the fabled Mountains of the Moon,first seen and recorded by Stanley.An exciting book of travel and adventure. 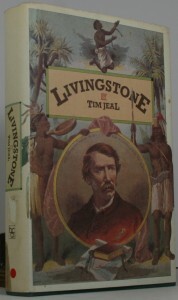 Here, in one volume of moderate size, and in Dr.Livingstone’s own words, is an account of the travels that made him famous. It has been compiled from Livingstone’s diaries contained in the three works; “Missionary Travels and Researches in South Africa,1857″. 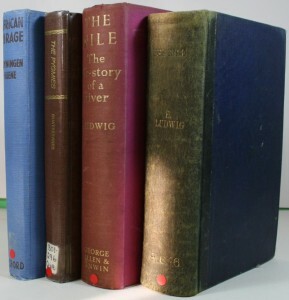 “The Zambezi and its Tributaries, 1865″,and the posthumous “Last Journals”,1874 all of which have been out of print for many years. 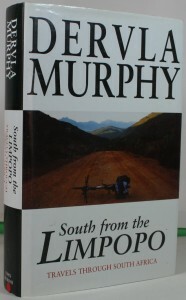 When Dervla Murphy first pedalled across the Limpopo she fancied that she ‘understood’ South Africa’s problems because for more than 40 years she had, from a distance, taken a particular interest in them. However, twelve hours into her journey, that illusion was shattered. “South from the Limpopo” reflects her moods of confusion and elation, hope and disappointment, as she tries to come to terms with a country, more complex and fractured than she could have imagined, but also more flexible, than she had expected. 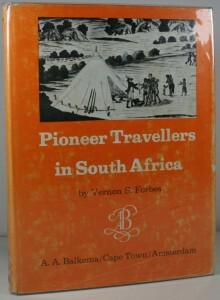 “Pioneer Travellers in South Africa” is a Geographical commentary upon routes, records, observations and opinions of travellers at the Cape between 1750-1800. 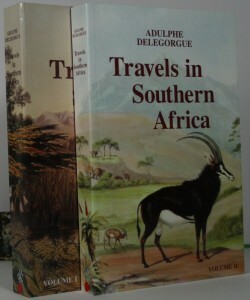 The golden age of travel in the Cape was the half-century covered by this book. This period saw great advances in exploration of the interior regions and expansion of knowledge of the physical and biological sciences. These achievements found expression in expedition reports, travel journals, books and maps which comprise the subject matter treated in this volume. 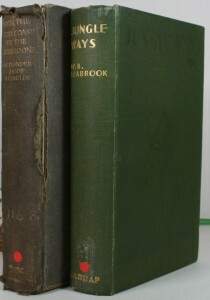 This is a two-volume set based on the travels and experience of Adulphe Deleogorgue,a young French naturalist with a passion for information,a keen eye and a ready wit. “Land of the Niamoo” is about travels in the Equatorial African forests. The French prospector Marcel Le Roy, takes us into the heart of the amazing forests of the Ivory Coast and Liberia. This thrilling book is his story, in brilliant detail, of the very strange world of the forest people, their mystical way of life, their beliefs and fears, especially the “Niamoo”. An interesting story about sorcery, witchcraft and adventure. This is the remarkable chronicle of a young Irish teacher who decided to abandon the conventional opportunities open to her at home, and take the less predictable ones offered in Africa. 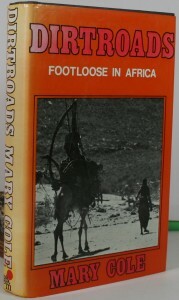 “Dirtroads” is Mary Cole’s account of her African years and it covers scenes that few tourists ever experience. A book of travel and adventure in Western Central Africa, from the Ivory Coast, Gold Coast, Togo, Dahomey, Southern Nigeria and the Cameroons. Set out in 21 chapters, it is packed with information regarding each country, its people and their social structure. 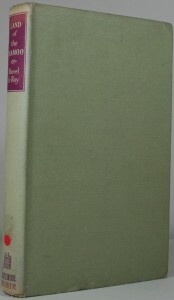 “The record of a journey” is a book of travel and adventure written by someone who, in the 1930’s, took a journey from Alexandria down to lake Victoria, and then returned to the Mediterranean via lake Chad and Algiers, armed only with a camera a pen and a diary. This is their journey. Africa is a continent of great rivers. This is obvious from a glance at the map. Then why not use the rivers as a waterway linking the West and East coasts? Delays and expenses would be cut down if a waterway was opened up. This idea was the motivating force behind the First Trans-African Waterway Expedition. 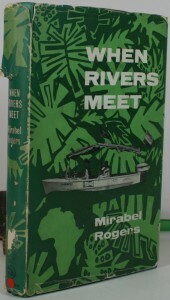 Mirabel Rogers covers the expedition for several newspapers. Nine men and four women, with their fibreglass boats, a jeep and a Dodge power wagon, attempted to open up such a route.